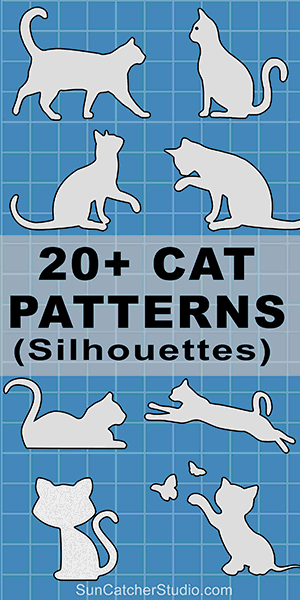 Cat silhouettes images, patterns, and templates. Use these printable, downloadable designs for woodworking projects, scroll saw patterns, laser cutting, crafts, vinyl cutting, screen printing, silhouette, die cut machines, coloring pages, etc. Patterns include Scalable Vector Graphic (SVG) templates and designs. Find more Patterns and Stencils. After selecting a pattern, you can specify: COLOR, SIZE, and format. Looking for More Patterns, Stencils, Designs? More FREE patterns and stencils. Find patterns on all 50 US States. Use the Alphabet and Number Stencils to create Word Art designs. Discover Scroll Saw Patterns and designs for Chess Pieces along with inspirational Religious and Christian Patterns. Don't miss out! Subscribe to receive emails about new patterns, stencils, plans, tips, and projects. Copyright © 2019 Patterns, Stencils, & DIY Projects. All rights reserved.